When you think of bacteria, you probably think about the ones that cause disease and are harmful. However, there are plenty of friendly microorganisms living in your digestive system that actually help defend against the harmful ones. A delicate balance of the good and bad bacteria is what keeps your gastrointestinal tract healthy. The same is true for your cat! If you’ve been around for a while, you’re probably familiar with those Jamie Lee Curtis commercials for Activia, and you’ve likely heard the term “probiotics.” Probiotics are living microorganisms that are similar to the friendly bacteria and yeasts that reside in the digestive tract. So, what can these friendly little guys do for your cat? What are the benefits of giving cats probiotics? If you’re a cat owner, chances are you’re familiar with a cat who has experienced an upset stomach and suffered from vomiting, diarrhea, or abdominal pain. While this may be a result of a stressful situation (my cat, Blaze, for instance has trouble traveling in a car and tends to feel stressed and sick on journeys), it can also be caused by changing your pet’s diet abruptly, antibiotics, parasites or food indiscretions (Blaze loves eating anything green and leafy…even fake house plants). In these instances, an imbalance between the good and bad bacteria causes illness. Probiotics can help restore that desirable balance and improve intestinal upset. Additionally, they can be used as a preemptive measure to help maintain the balance between good and bad bacteria. For example, if you know your pet may experience belly upset, such as when your cat is going to be boarded for a time or if you are going to be changing your pet’s diet, you might consider the benefits of giving your cat probiotics preemptively, to help prevent unpleasant side effects. Antibiotics are meant to treat bacterial infections, but unfortunately they don’t know how to distinguish between good and bad bacteria. Antibiotics should positively affect your cat in that they will fend off infection, but your pet may also experience adverse side effects like diarrhea and other gastrointestinal upset. Administering probiotics prior to or concurrently with the antibiotic may help prevent these side effects and restore proper balance to the digestive tract by replenishing good bacteria. Probiotics offer numerous health benefits, including improved digestive and immune health. Improved digestive health is linked to a more efficient absorption of important nutrients from our diet, and more optimized digestive processes allow greater nutritional benefit from food. 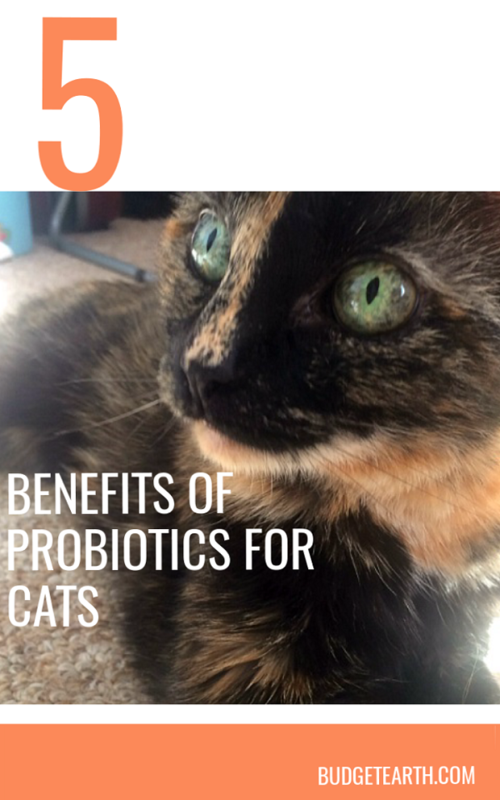 Another benefit of probiotics for cats is that they can help assist good bacteria in competing with bad bacteria for nutrients and intestinal binding sites, as well as help the immune system fight off pathogens. Probiotics help regulate the intestinal immune response. They can enhance the immune response against microorganisms and dietary antigens (toxins or other foreign substances). In other cases, a benefit of probiotics for cats is that they can help down-regulate the immune system and help prevent the onset of intestinal inflammation and allergic response. For cats who experience intestinal symptoms like diarrhea, constipation, and flatulence, probiotics can prove beneficial. In some cases, probiotics can displace the need for antibiotics or expensive food trials which may cause stomach upset. Another benefit of probiotics for cats is that that they can help prevent diarrhea and, at higher doses, can be an effective treatment for it without having to rely on pharmaceutical drugs or other interventions. As with any new product, it’s important to do your research and always talk to your vet about possible supplementation and whether probiotics would be a good fit for you and your pet. The FDA doesn’t regulate probiotics so there are a lot of options to choose from but not all products are created equal. As with human dietary supplements, companies can print unfounded claims about their products on the packaging without having to guarantee their safety or quality so it is important to buy from a reputable source. For pets and humans in our family, we personally trust Humarian. Why Humarian? Because they are one of the only probiotic companies that are transparent about their product and back up their probiotic with extensive research. Additionally, their probiotics are organic, all natural, and free from gluten, dairy, sugar, soy, eggs, fish, shellfish, peanuts, and tree nuts. See why we love Humarian and their cat probiotic here! Before you try it yourself, though, don’t forget to use our coupon code to get 20% off your order (BUDGETEARTH). Was only a while ago did I hear about probiotics for cats. I’m bookmarking to read later. I sometimes foster cats with tummy problems. My cat Ginger rarely has tummy issues.